Tinder has launched a desktop app to enable its users to find matches at places where mobiles are not allowed or at places with connectivity issues. Tinder has always been a mobile-only app which has been appreciated by its customer. However, using the app in places with poor connectivity has been a problem. It also consumes a considerable amount of data due to the images. It has also been difficult to use the app at places where the use of mobiles is discouraged such as classrooms or workplaces. Not anymore! Tinder has found a perfect solution to such problems. Tinder, the popular dating app will now be available on desktops too. Tinder recently launched the Tinder Online app for the desktop which users will be able to use from their PC and with places that have poor mobile network coverage. The new Tinder Online app’s interface is slightly different from the Tinder mobile app. There is an all-time visible conversation panel on the left which will urge users to have more conversations with their matches rather than just swiping left/right. The other half of the screen has the match swiping panel where users can swipe through their potential matches. Hence, many users will spend their time swiping matches and then making conversations with them. Now the two activities can be carried out simultaneously. Is Tinder Enabling Serious Relationships With The New Interface? 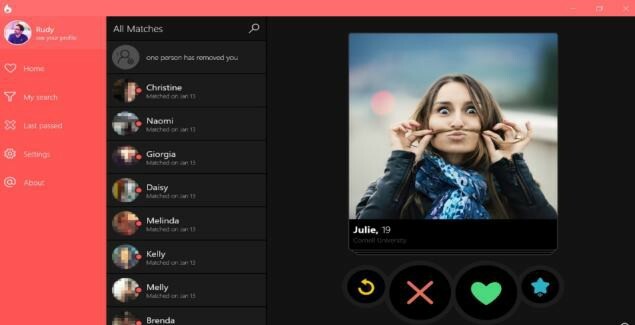 Tinder, for now, is testing the new Tinder desktop app in low network places like Argentina, Columbia, and Brazil. But, soon the app will be made available in India. The launch of the new Tinder desktop app is expected to encourage users to have more conversations and serious relationships. It looks like a lot of married couples in future will share their stories of Tinder love on social media after this significant move from the company.